Every player's dream is to feature at the World Cup and for Alex Iwobi that dream is on the verge of being achieved having made the informed choice of playing for Nigeria instead of England. 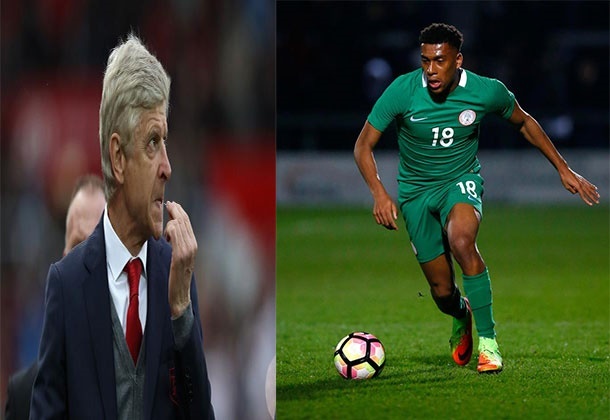 Proud of what his little boy has achieved, Arsenal coach, Arsene Wenger has opened up on the actual reason why Iwobi opted to play for the Super Eagles. In an interview published on the Arsenal website on Friday, Wenger explained that Iwobi was obviously wanted more by his father's land than England hence the decision of the forward opting to wear the Green and White jersey. “He brings his quality to Nigeria - he’s absolutely a creative player going forward. He’s very strong in small spaces and he’s starting to score goals as well. “For a while it was open between England and Nigeria, and England didn’t really push for Alex during that period. Nigeria were more willing to have him. I’ve seen many times that sons of parents from Nigeria want to go back to their parents’ country.” The French coach added. Iwobi is currently a National hero, having scored the goal that secured a Nigeria's spot at the World Cup in Russia. ALSO WATCH: Bounce Sports EP. 3 - Will Super Eagles Beat Algeria and Argentina?